Worldwide, nearly 1,900 salons and 20,000 people represent the DESSANGE International brands every day. Both as a franchisor of this network of hair salons and as a manufacturer of cosmetic and hair care products, we realize that we have an impact on the environment, our employees, and our society. 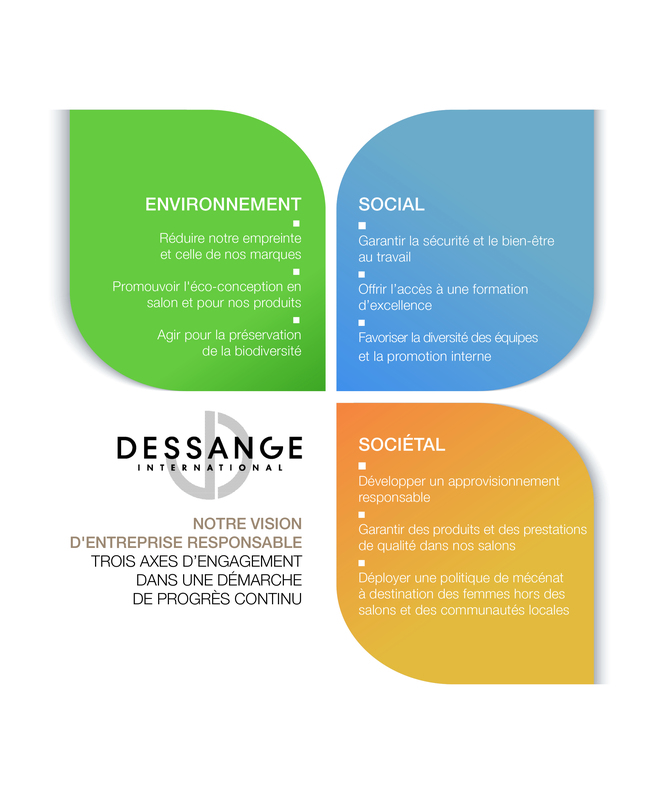 We are driven by a commitment to excel in developing our brands while limiting our environmental footprint and impact on people, which makes DESSANGE International a company that drives change in the field of Corporate Social Responsibility (CSR). The hairdressing industry is characterized by high standards and expectations for exemplarity, which are reflected in the Corporate Social Responsibility (CSR) approach we have been applying since 2007. We provide the resources our brands and networks of hair salons need to take concrete actions toward an ambitious approach to control their footprint. We firmly believe that responsible success is lasting success. We consider it essential to address these challenges in all our businesses in order to achieve economic success with sustainable development for our brands and networks of hair. Our footprint is closely tied to the nature of our businesses, which all have identified impacts on the environment : they emit carbon, generate waste, and consume energy and water. DESSANGE International is aware of these issues, and wanted to respond by implementing specific action plans to achieve continuous improvement in each activities of the group (salon, products, industrial site). We realize that our business can have an impact on the communities that make up our “ecosystem,” which are directly and indirectly affected by our strategic decisions. We believe that sustainable, responsible success must be supported by involvement in our society, benefiting women and local communities, which is central to our approach.